Water babies swim at 1 year old is it possible? Babies swimming at 1 year old. 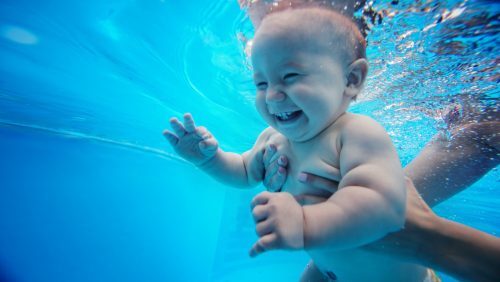 Is it possible that a baby so young can really swim ? The answer is yes. It takes some training to teach babies how to swim but its a valuable lesson they can learn. Besides the earlier the better. You’ll then find they are in fact water babies. A while back after watching a Facebook video go viral. Afterwards it made me want to teach my own granddaughter to swim . At the time she was 2 and a half years old. To begin with The video in question is where a toddler falls into a swimming pool. Thereby the toddler is fully dressed. 11 toddlers die every year by falling into pools or paddling pools. It’s the leading cause of death in under 4 year olds. Here in the uk I searched everywhere. I wanted swimming lessons for babies using this method, like the toddler uses in the video. Its called ISR baby survival . No one does it. So I started watching the teaching videos online over and over again. A baby swimming underwater in the pool. Its not for the faint hearted teaching a baby to swim this way. Being a Nana was difficult even for me. You are teaching them to go under water to float on their back and at first if they can say some words they may cry or say No. I took her to the local swimming pool and started the ISR swimming method. I realised after going once a week it wasn’t enough. So then we did 45 min sessions twice a week. approx. 45 mins play laugh splash then work as we call it. repeated twice in the session. A couple of weeks later we had to stop. My granddaughter had an accident at home. In fact it put her back for having more swimming lessons for months. In January 2019 she was fully healed from the accident so we started again. Now we are in march 2019 this is where she is at. She can float on her back but likes to hold the edge of my costume for confidence. She can jump in the children’s pool without anyone catching her. Next she can hold onto the side unaided. Coupled with going to the edge of the pool she kicks her legs if you hold her about 12 inches from the side.she can hold her breath and swim under water to you if you hold her. Although she doesn’t like going under water near the steps. If you start her off she can get a toy off the middle step underwater. She is confident at the swimming pool and likes to stay 1 and half hours now if you let her. I’m not as strict with her now she’s talking she says ” I don’t like it in my eyes” or ” its too deep”.